It seems that I am to be known for my button grafts, a feature on a violin that if done correctly is very difficult to detect. This is because, truth be told, it probably shouldn’t even be there in the first place, for it likely indicates that an error has been made. Occasionally I get carried away while drawing the outline of the back plate and forget to pencil in the button, that little half-circle that rises from the edge of the upper bout and is designed to support the heel of the neck. If I don’t catch my mistake soon enough, I end up cutting out the back plate without adding this important shape into it. A button graft is done when one needs to repair this mistake and hide it at the same time. Sometimes the graft is also needed when the wood is not big enough to accommodate the entire back of the instrument with the button included, and in this case the graft is a planned part of the build. Here you can see I am working on rough-arching a back that I still haven’t noticed is missing the button. Can you spot the problem? Once the mistake is realized, after the appropriate face-palms and so forth have been administered, the problem can be fairly easily remedied in a way that is not very visible if done well. The first thing to do is to fetch the original piece of maple from which the back was cut (hopefully you haven’t thrown it out!). From this piece, I cut a blank that will become the button. I mill it down to about 5-6 mm thickness and 24mm wide. One thing to keep in mind is that the button is in the center of the back plate, where often two pieces of maple are joined. The button should also have the joint seam in it, and should match the wood of the back as closely as possible. I try to cut the button blank from the exact spot of scrap where it would have been drawn had I not forgotten to do it in the first place. 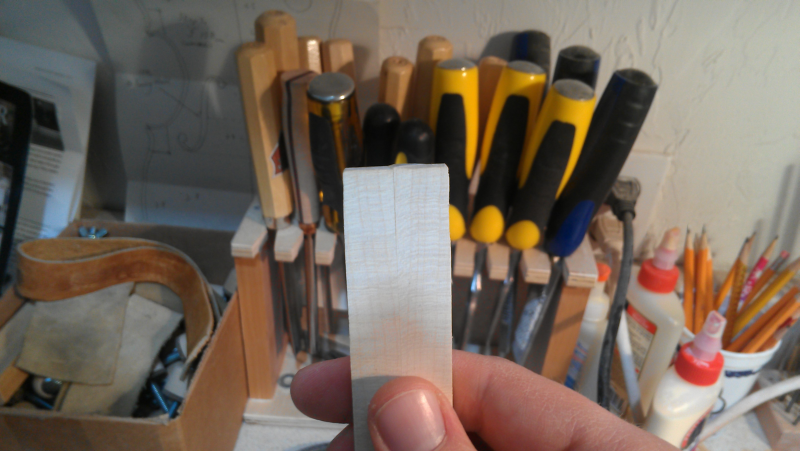 A blank cut from the original maple stock. It’s only as wide as the button needs to be and about 5mm thick. 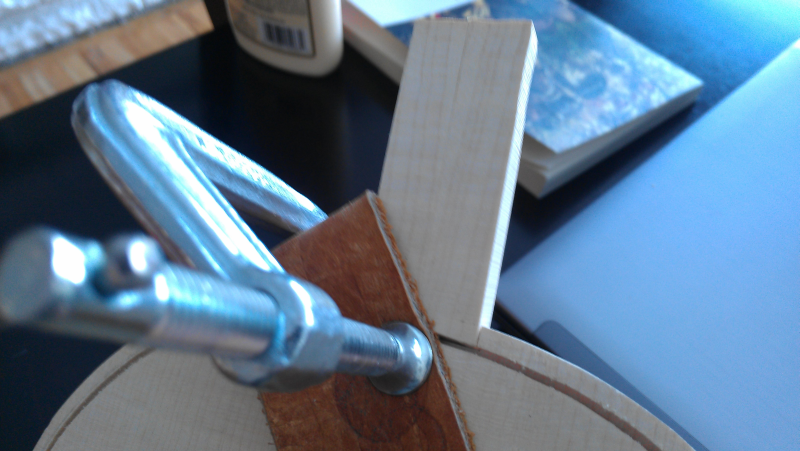 Once I’ve got my button blank, it’s time to start cutting a mortise for it on the back plate of the violin. I’ve sometimes heard this repair called a “Dutchman Inlay,” although it doesn’t resemble the bow-tie shape one often associated with that particular sort of repair. Two very small cuts. Here you can see I’ve already put in the purfling channel, let us say for illustrative purposes. 😉 The purfling channel need not be cut at this point, but you need to know where it is going to be; typically about 4mm in from the edge. 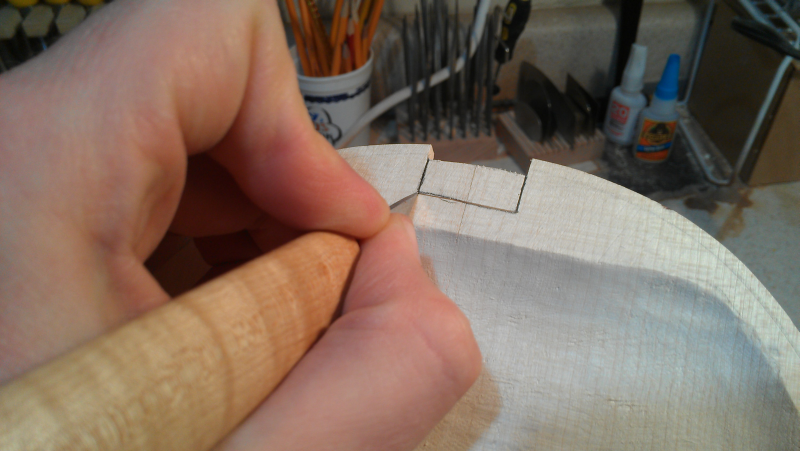 Remove the edge of the plate between the cuts, down to the purfling line. 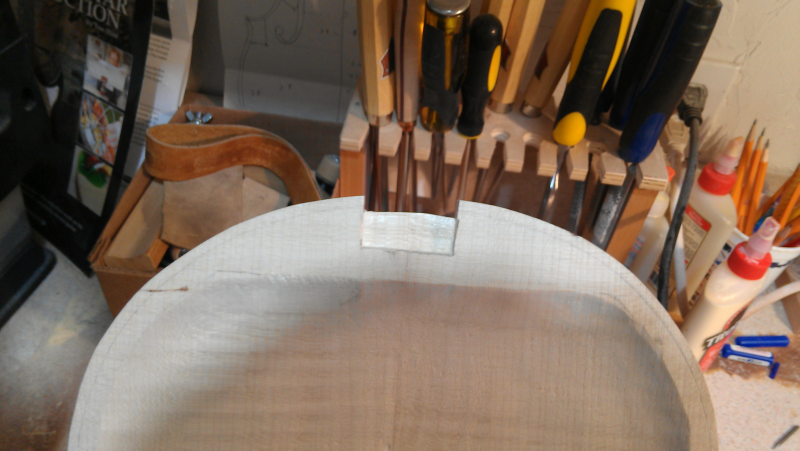 Now the plate is turned over, and I draw in the inlay mortise that I want to cut. This is cut into the part of the back where the neck block will cover, and also being on the inside of the violin, will never be seen. 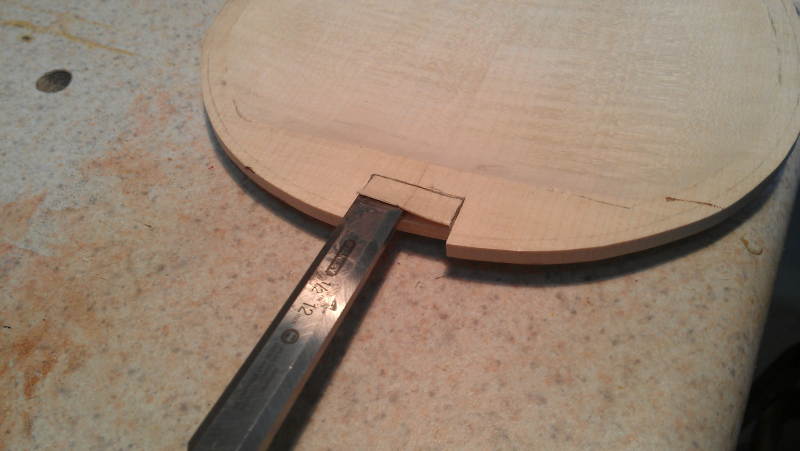 Draw in where you want to make the mortise on the inside of the plate. I use a sharp chisel to clean out the mortise. I cut it to no particular depth; not too shallow, not too deep. Go by what you think is best. A chisel is used to clean out the mortise. A view of the completed mortise. At this point, I test-fit my blank into the mortise and do any cleanup work on it. 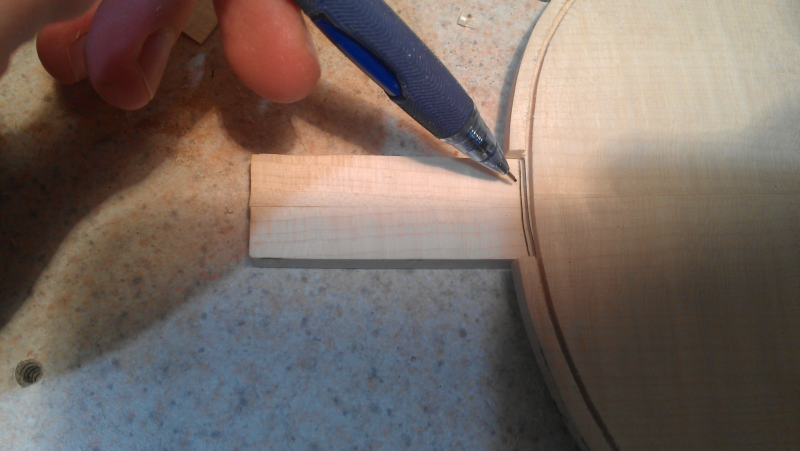 Then I draw onto the button blank a line for the tenon. Marking the edge of the tenon. 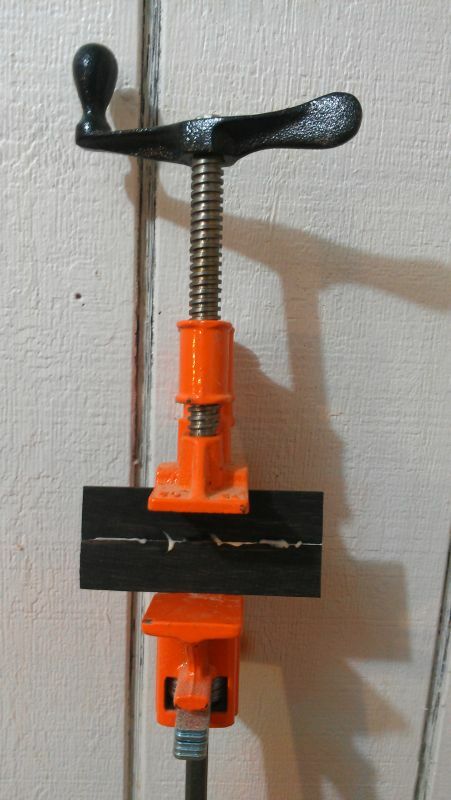 Put the blank in a vise, and use a knife and chisel to cut the tenon down to the line. It needs to be just right to fit in the mortise and have enough depth to level with the top plate once installed. Carving the tenon in the button blank. The tenon is glued and clamped. I did this inside where it’s nice and warm, since my workshop is so cold in the winter that gluing is impractical. 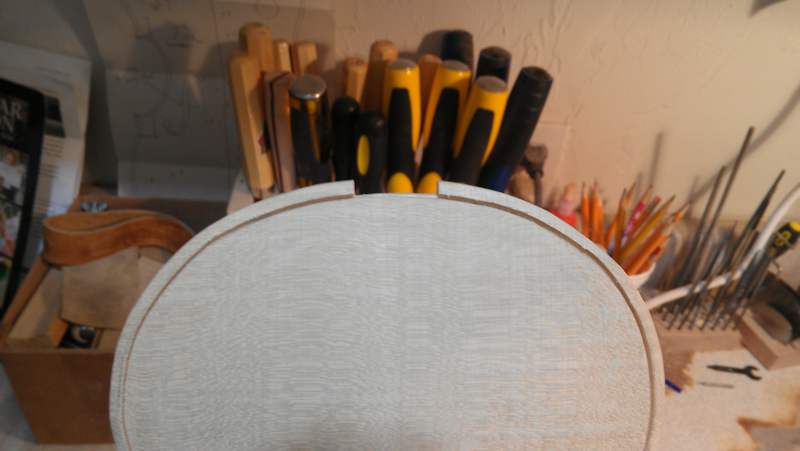 When finished, all that will be visible are the two initial cuts, and if you are good enough, the joint will be so tight, even those will be hard to see. The longer joint is hidden in the purfling channel, so it is well hidden. Here you can see that I just need to blend the button a little bit, to match the top of the plate, and it will be as if nothing happened. This is a handy fix to have in one’s repertoire in case of accidents, or for those times when you want to use a piece of wood that that isn’t quite roomy enough to fit the button. 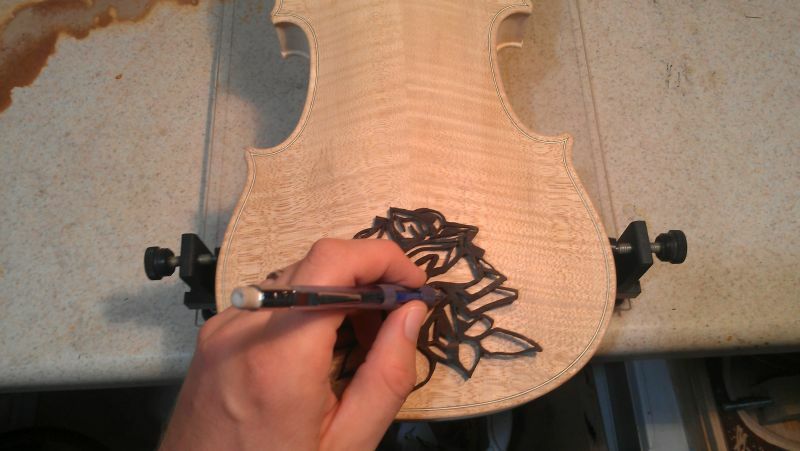 Here is a vagary I devised: What if I inlaid the back of a violin? It’s been done before, to good effect. Maggini got a little carried away with purflings, for example. Others have used pearl inlay and so forth. I wanted ebony. I brought the idea to Dave, who is an illustrator. We worked out some designs on the computer and Dave came up with a fine vector graphic of a rose, based on some photography he did of the local flora. First, I obtained some materials. 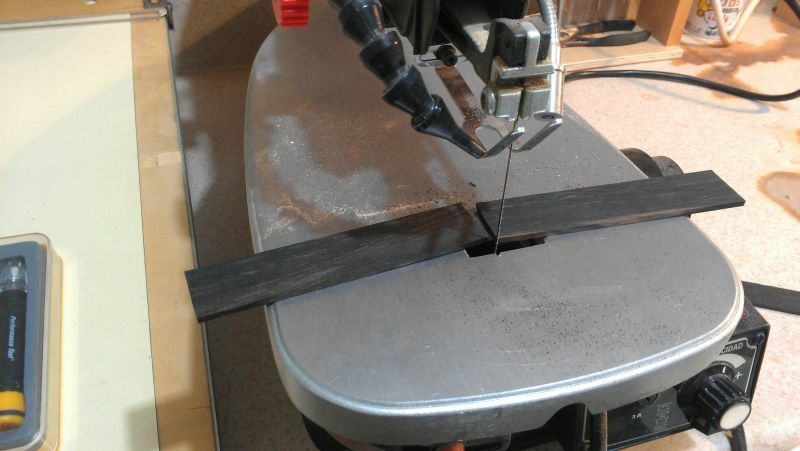 I bought 1/8″ thick ebony blanks from Matt Furjanic at Inlay Banding. It’s good stuff and not that expensive. 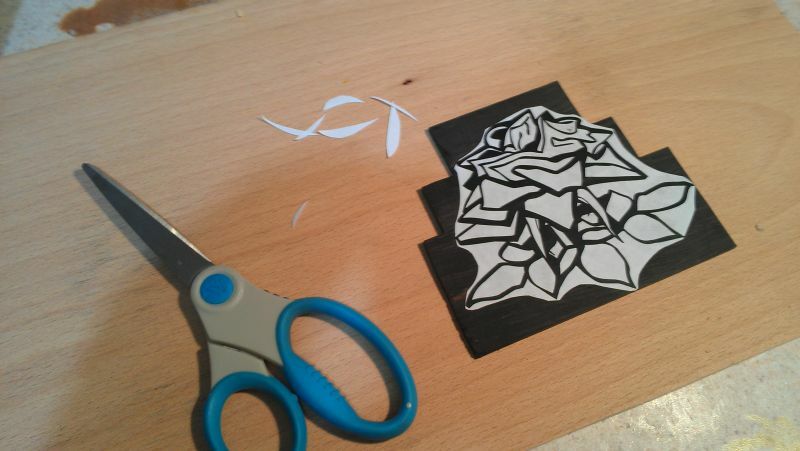 Materials for the rose inlay: Ebony blanks, and a design printed on regular paper. Since I wanted to cut this inlay in one piece, I needed to glue up the blanks into a slab that would accommodate the entire design. I think a lot of inlay artists do this work piecemeal, mostly because they are working with small bits of shell. I couldn’t come up with a great way to divide this design up, and it was easiest for me to think of it as one piece. 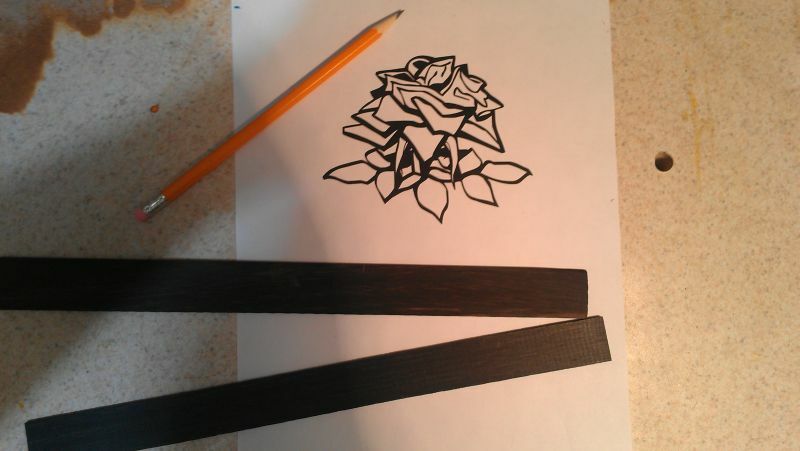 I’m cutting lengths of ebony that will be joined into a chunk big enough to accommodate the entire rose design. Before joining the wood, it has to fit perfectly. That means the edges must be planed perfectly flat. I checked the pieces against the design and glued them together with wood glue. 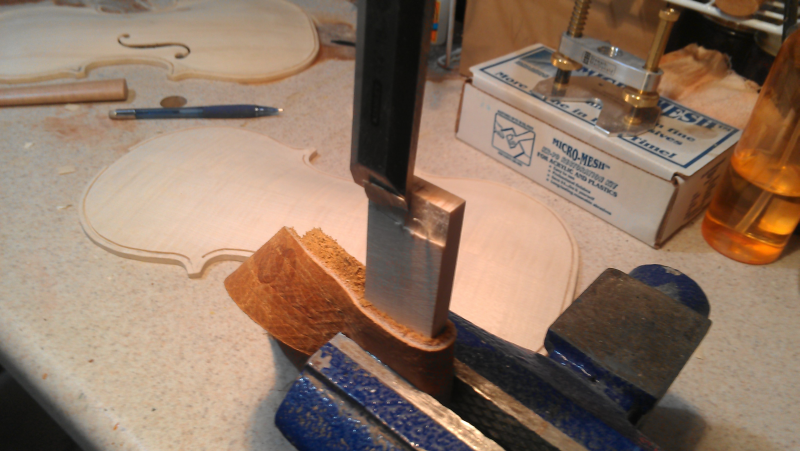 I clamped the pieces together in this bar clamp which I use for joining violin tops and backs. I ended up stacking four of these strips. Here I’ve glued the pattern onto my ebony. 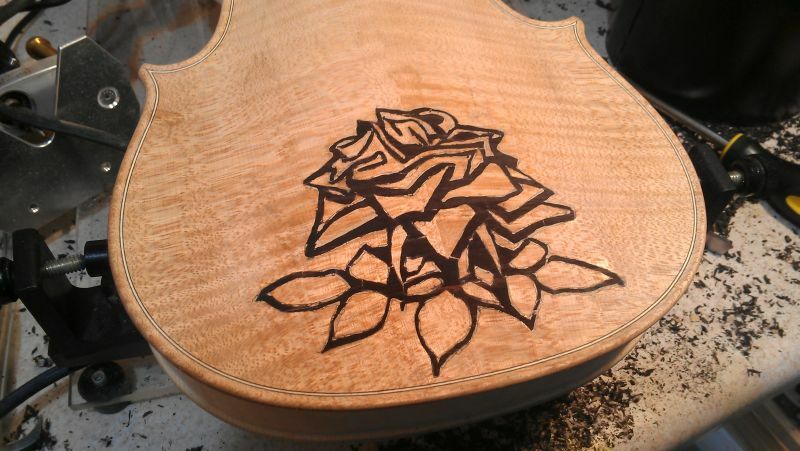 I’ll cut all of the white bits out to get my rose pattern reproduced in the wood which will be inlaid into the violin back. 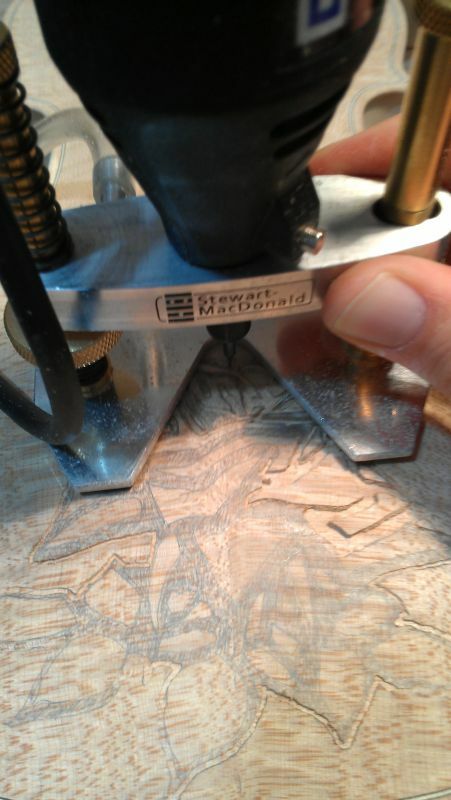 I devised a way to cut out the inlay with my routing setup. 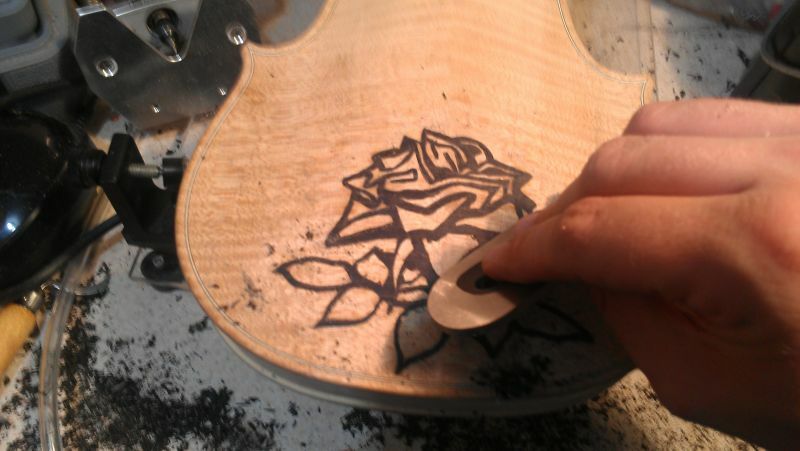 It worked once on a small piece of shell my daughter once inlaid on a guitar. 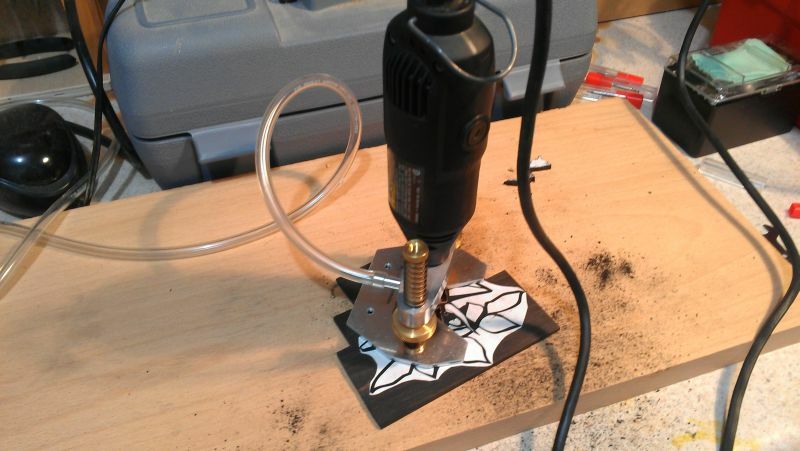 It didn’t work for me and I ended up ruining a router bit. 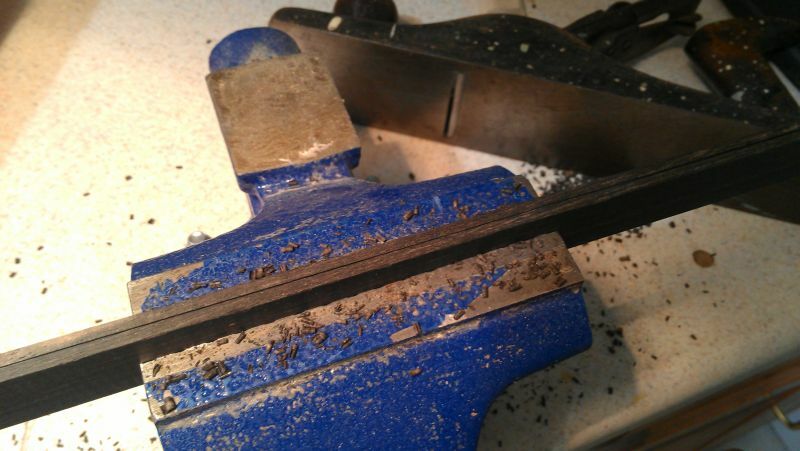 I drilled holes in the corners of the design and used this fine jewelers saw to cut the inlay. I broke maybe 10 blades throughout this exercise. 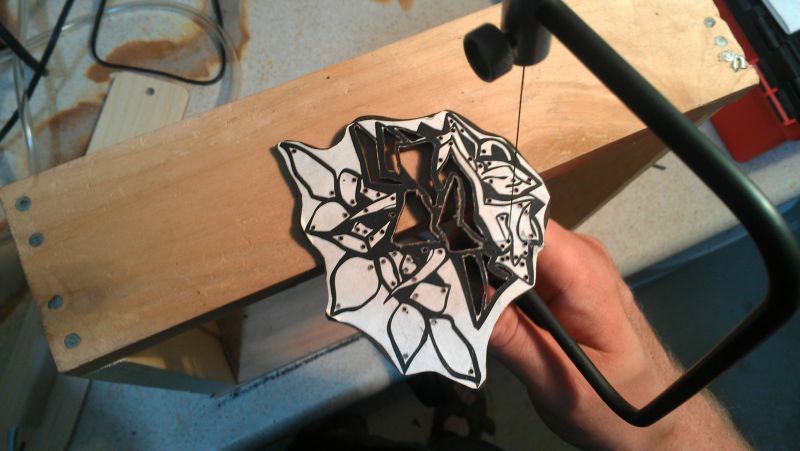 I kept dropping the inlay piece during my work, smashing it to bits on the floor. I had to re-glue it each time. Why didn’t I start out with smaller pieces in the first place? 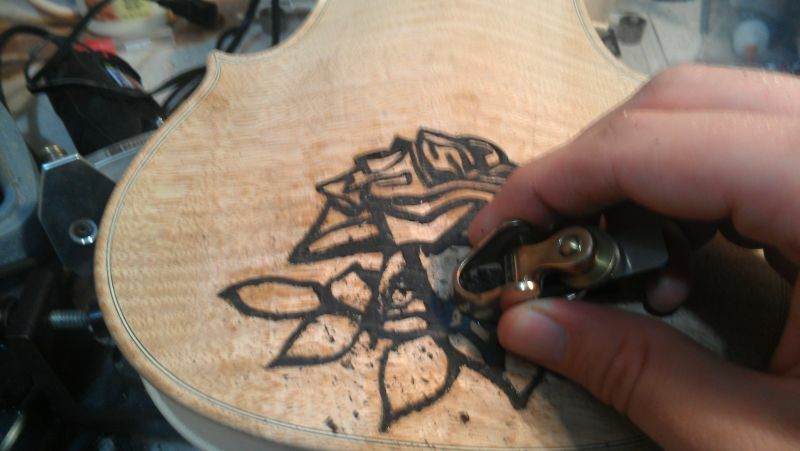 I’m using a fine-point mechanical pencil to trace the inlay onto the back of the violin. I’ve drawn and colored in the inlay rout with a pencil. 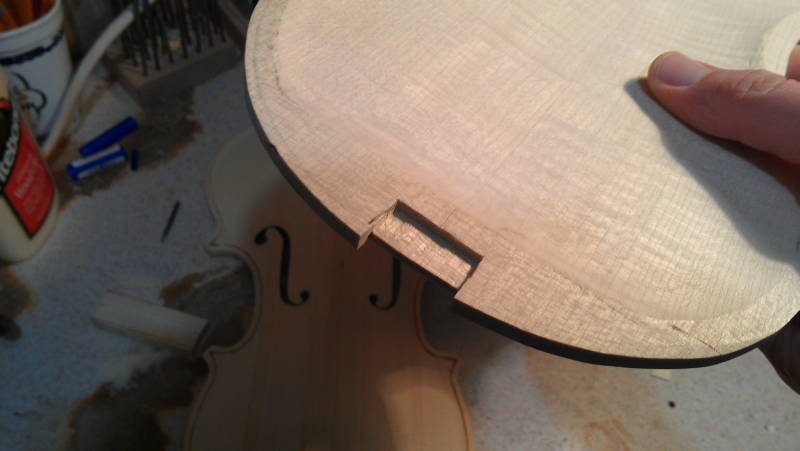 I’ll rout the dark areas out of the back and fit the ebony into the cavity. 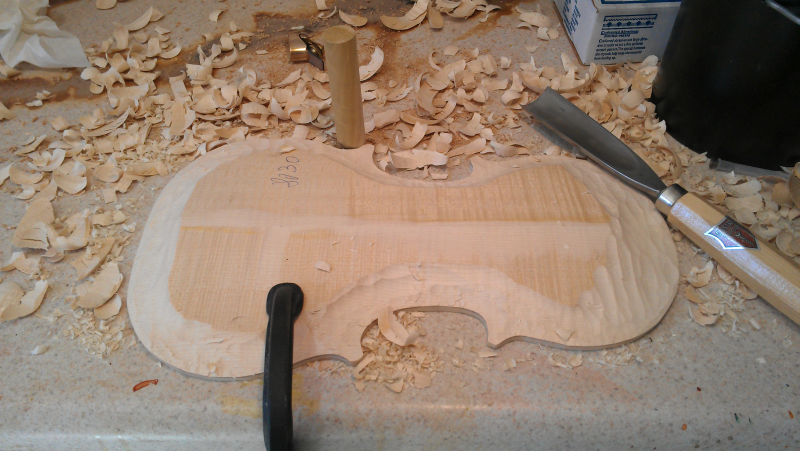 I’ll need to break my flat ebony piece into several smaller bits in order to manage that arching. 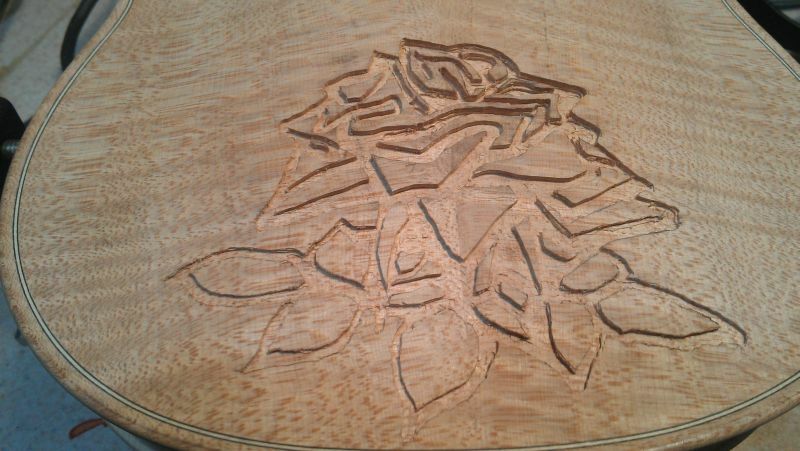 I use a high-speed Dremel tool and a small router base to accomplish this work. The completed inlay rout. It’s not bad, but I’ll eventually be able to make these very accurately if I continue to do this sort of work. I used hide glue to install the ebony in the routed inlay cavity. I had to break my piece into several smaller ones to fit the contour of the back, again reminding me that inlay ought to be done in small pieces for a reason. 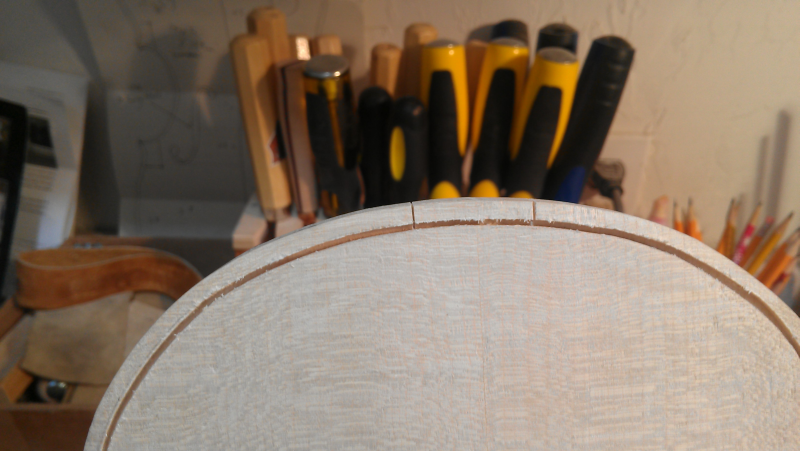 The inlay rout was shallower than the ebony was thick. 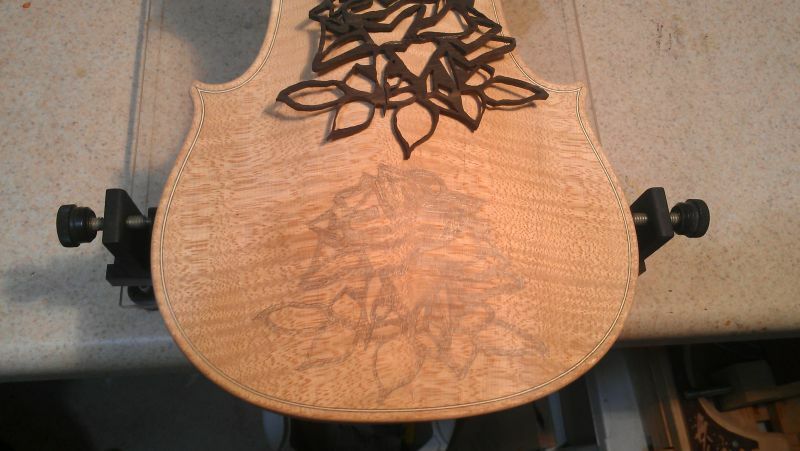 I need to plane off the part of the inlay that sticks up above the surface of the violin. 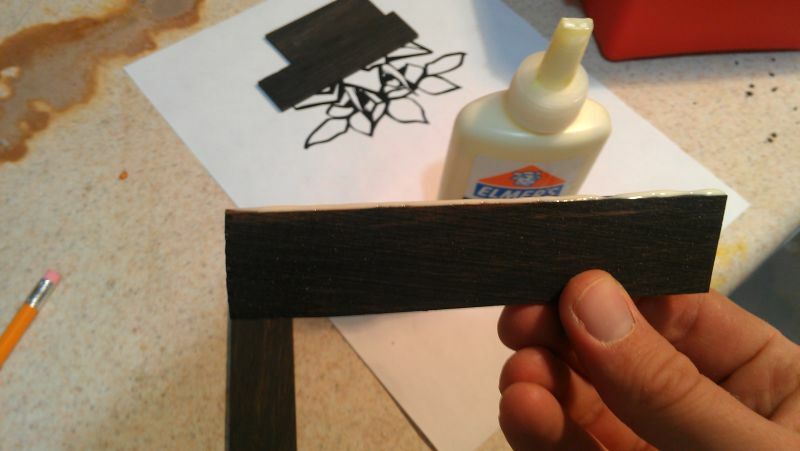 Before it can be varnished, the inlay needs to be very smooth and level with the rest of the wood surface. I use a thick scraper to do this fine work. 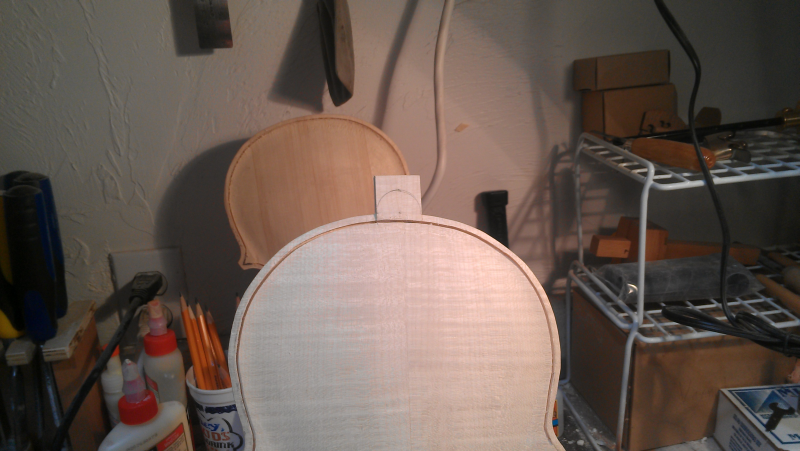 The inlay is done and the violin is ready for varnish. 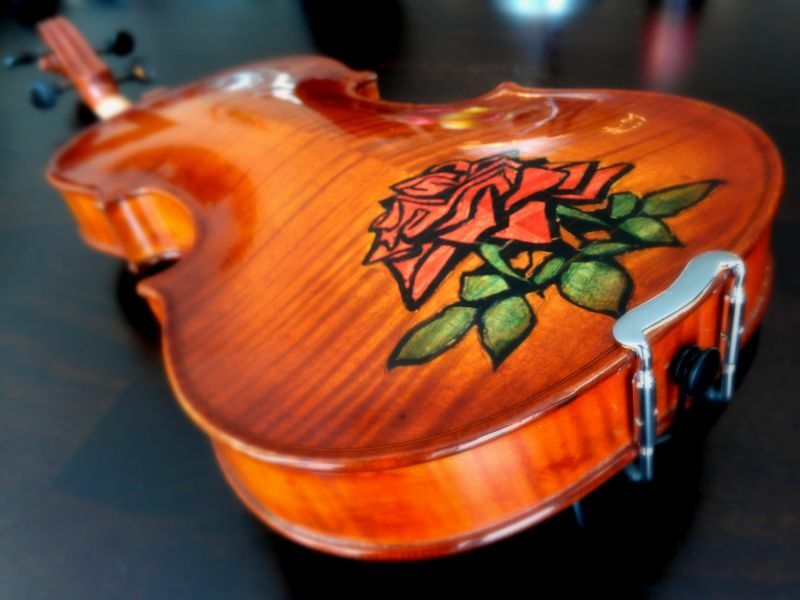 Here is the completed fiddle!